BiggerBooks, online at biggerbooks.com, is the shop for finding the biggest selection of books at the best prices possible. BiggerBooks offers a wide selection of new books, used books, textbooks, best sellers, ebooks, classics, children's books, and more. BiggerBooks carries all subjects and genres, from art, humor, health and wellness, history, social science, performing arts, fiction, family and relationships, computers and technology, and so much more. But before you shop a great selection of books, save with all the latest biggerbooks.com discounts, BiggerBooks promotions, and BiggerBooks coupon codes found here at RetailSteal.com. BiggerBooks ships within the United States, including Alaska, Hawaii, APO/FPO, PO Boxes, Virgin Islands, Guam, and Puerto Rico. Some restrictions apply. See site for more information. 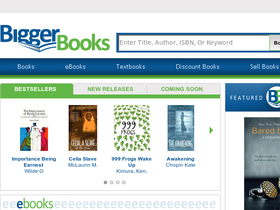 Shop at BiggerBooks and enjoy $5 savings on orders $100+. Click here for code. Save up to 60% or more on college textbooks from BiggerBooks. Click here now to save on new and used titles. Shop online at BiggerBooks.com this Tuesday and enjoy a 7% discount on your order of $75+ with this coupon code. On Mondays only, save $10 off your order of $150+ with this coupon code from BiggerBooks.com. BiggerBooks offers free USPS shipping on all purchases $79+. Click here to shop. Enjoy savings up to 90% on books on clearance at BiggerBooks.com. Click here to save on titles like To Kill a Mockingbird, Of Mice and Men, The Great Gatsby, and many more. Save up to 60% or more on discount eBooks from BiggerBooks. Click here to shop. Save $3 on purchases of $60 or more when you use our coupon code at BiggerBooks online. Click link to save now.